Prohibition Agents Ludwig Johnsen, Arthur Means and Gerald Church were searching for a reported still in woods near Leavenworth, WA. While walking, the agents happened to come upon two armed men, only later identified as local officers. Agent Johnsen announced his identity and ordered the men to halt, but for inexplicable reasons, the local officers continued to approach and gunfire erupted. Before calm and order could be restored, Agent Johnsen was seriously wounded and the two local officers had suffered minor wounds. Agent Johnsen was rushed to the local hospital, but died during surgery. 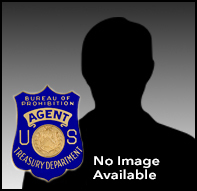 Agent Johnsen joined the Prohibition Unit on December 23, 1926. Agent Johnsen was born in Davenport, IA. He was survived by his wife, Mary, who resided in Spokane, WA.